sulphur fertilizers (e.g. calcium sulphate/gypsum). The fertilizer industry is known for its strict environmental regulations. 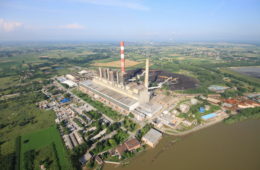 These regulations are mainly focused on limiting harmful emissions. AMECO’s indoor storage solutions aid fertilizer manufacturers in controlling such emissions and thus complying with such regulations. AMECO offers solutions for both longitudinal and circular stockyards. The latter are particularly interesting where space is limited. One of the largest fertilizer manufacturers in the world, Engro Fertilizers, Pakistan, has been equipped with two AMECO machines: an AMECO conical rotary scraper, and an AMECO elevator travelling (ET) scraper. AMECO supplied and commissioned this equipment to make the handling of Engro’s urea operations more reliable, which in turn has led to greater efficiency and lower operational costs. Engro Fertilizers Limited, a subsidiary of Engro Corporation, is a major fertilizer manufacturing and marketing company having a vast portfolio of fertilizer brands optimized for local cultivation needs and demand. Engro is the first company to have setup a urea production facility in Pakistan, a landmark event in the agricultural sector of the economy. This, together with the fact that urea is the most widely used fertilizer in the country, gives Engro a special standing in the domestic fertilizer market. Fertilizers such as ammonium nitrate, urea and NPK are commonly manufactured as prills. Prills are formed by allowing drops of the melted prill substance to congeal or freeze in mid-air after being dripped from the top of a tall prilling tower. AMECO’s rotary scrapers are designed to reclaim fertilizer prills efficiently from the bottom of prilling towers and can be flat prilling tower reclaimers or conical prilling tower reclaimers, designed specifically to fit the shape of the tower floor. The rotary scraper is composed of a structural boom with scraping blades that rotate around a central point. Rotation is activated by means of a slewing drive, designed as a dual drive system. This system ensures that the scraper can continue to operate, even if one of the drives is undergoing maintenance. The reclaimer rotates at the bottom of the tower and loads the prills onto a conveyor belt located below a trough installed inside the tower floor. 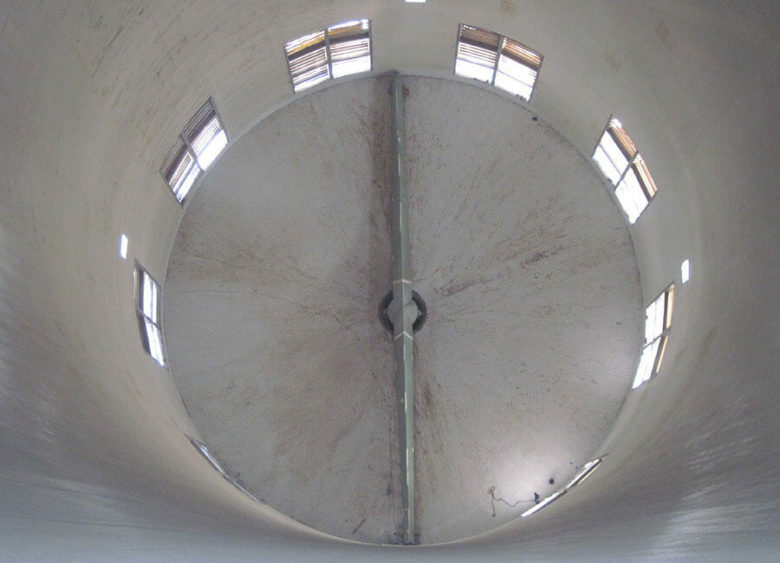 A conical rotary scraper for urea was installed at Engro Fertilizers in Dahaki, Pakistan. Engros rotary scraper works around the clock reclaiming the urea prills falling from the tower directly into a downstream conveyor. 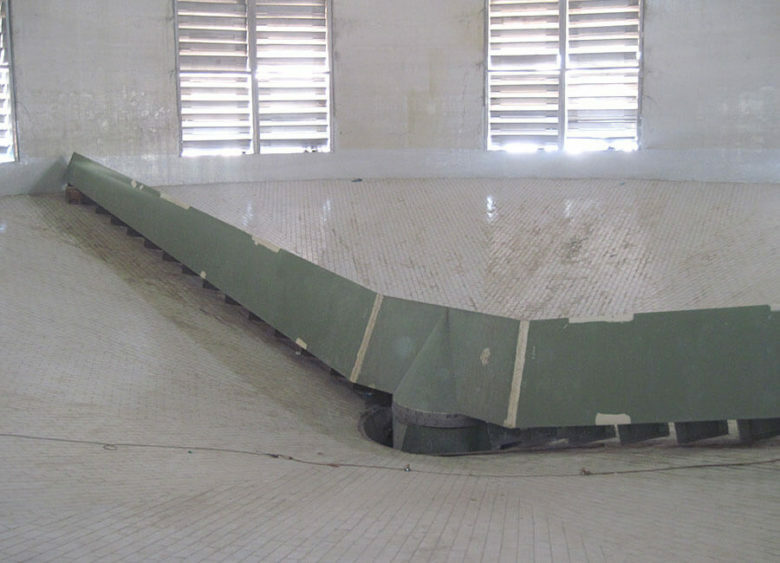 In this case, the discharge point into the downstream conveyor is located on the centre of the prilling tower base, adjusting to the tower floor by adopting the same angle. 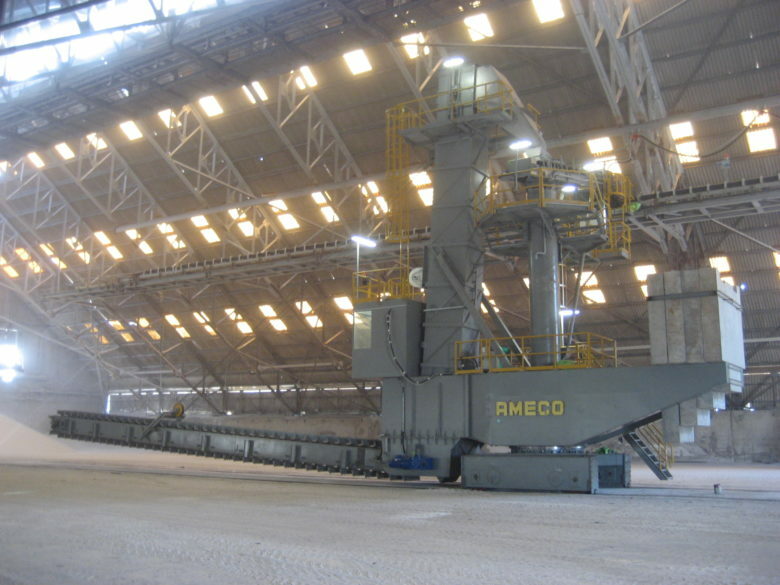 AMECO is a major supplier of rotary scrapers, especially for urea granulation towers, delivering its bulk handling equipment in fertilizer production plants throughout the world. The machine begins operating at the end of the stack and, by a pivoting action, lifts the material from the heap and takes it away by means of an underground conveyor or by a bucket elevator fitted to the machine. The ET scraper pivots a few degrees left and right at the summit of the stack. As soon as the rake chain leaves the stack, the pivoting actions tops, the scraper arm is lowered to a few degrees and the pivoting action is resumed in the opposite direction. The main advantage of this reclaimer lies in the fact that the stocking area can be used to its maximum. 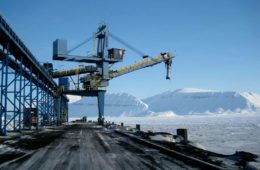 It is designed to reclaim bulk materials from a reclaimer travelling in the pile right up to the roof of the stockyard. oversee, organize and co-ordinate the erection, commissioning and/or start-up of AMECO-supplied equipment by a third party contractor. maintenance services by a multilingual team of inspectors and engineers, covering all its customers worldwide, including inspections, refurbishment, preventive maintenance and repairs. keeping long lead items in storage for emergency parts.